Get lean and strong with the ultimate list of protein shakes and smoothies. These recipes enhance your protein powder with the addition of healthy, delicious ingredients. Whether you're eating to bulk up or slim down, your diet probably includes a protein shake or two...or 10. Blend in some game-changing ingredients to boost your results—and make shake time the most decadent part of your day. 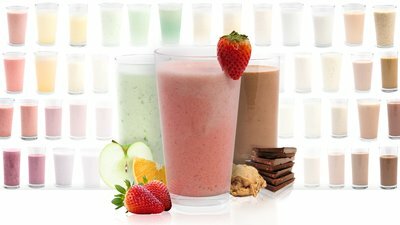 Before you dive into the individual recipes, bear in the mind that Bodybuilding.com offers a vast array of protein powders to help you whip up healthy concoctions such as these. Once you’ve zeroed in on the type of protein you need (whey vs. casein, plant vs. egg, etc. ), the reader reviews are a great way to find which products your peers like best. Get your blended coffee or pastry fix with a lot less damage. These yummy, breakfast-inspired protein shakes are perfect when you need a sweet treat. The oatmeal in many of them provides healthy, complex carbs and great texture. This protein shake can be made vegan by using plant protein powder and skipping the Greek yogurt. Shake up your breakfast with vitamin C and a bright flavor from fresh oranges. Yes, you can have a chocolate mint milkshake for breakfast. No guilt, no apologies. Power up your protein shake with liquid minerals and flaxseed. Make your Instant Breakfast go further by blending it with extra goodies. All the flavor of your favorite breakfast pastry, without the 10 a.m. sugar crash. This hearty protein shake will take you through whatever your morning throws at you. Bran flakes and oatmeal provide slow-digesting complex carbs for sustained energy all morning long. Ditch the sugary smoothies for one of these protein-packed berry shakes. Strawberries and blueberries offer a good dose of vitamins A, K, and B complex. They're also full of calcium, magnesium, and phosphorus. The berries in this recipe pack a lot of fiber to keep you full longer than a simple protein powder shake. Frozen strawberries minimize prep time and maximize nutrients in the most indulgent way to take your creatine. This triple hitter of protein, fiber, and healthy fats will keep you deliciously full for hours. This simple shake is easy to throw together when you're in a hurry, and super nutritious due to the fresh fruit. Macadamia nuts add healthy fat and rich flavor to this strawberry protein shake. Low-fat sour cream is the secret ingredient that gives this shake its cheesecake tartness. Are you team strawberry or team blueberry? Why choose? Make this shake with vanilla protein powder for an extra creamy-dreamy treat. Pineapple juice wakes up this protein shake and makes it extra quenching post-workout. This shake hits all the berry bases with strawberries, blueberries, and raspberry yogurt. If the craving for chocolate overwhelms you, reach for the blender instead of the candy jar. You don't have to give up dessert when you're chasing gains—just do it right. Feel like a kid again with the classic combo of peanut butter and banana. The most simple and sinless way to get your peanut butter and chocolate fix is right here. Instant pudding makes this protein shake extra rich and creamy. Chocolate on chocolate? Yes, please. There's nothing better than an iced mocha—except one that will help you get swole. This kicked-up protein shake tastes like a candy bar in a glass, minus the empty calories. Creamer isn't just for coffee—it's a game changer for your protein shakes. Go ahead and blend cookies into your protein shake. We won't tell. These tropical smoothie recipes will bring some fruity goodness into your high-protein meal plan. Blend one up and pretend you're lying on a beach somewhere warm. Your mind and body will thank you. Experiment with whatever fruit you have available. If you're a mango fanatic or love kiwis, throw them in the blender. Sip on a burst of color anytime with coconut cream, blackberries, vanilla, mangoes, and orange juice to tantalize your senses. Absolutely the most fun way to take your multivitamin. Creamy and tangy, this recipe will shake you out of your protein-shake rut. Bonus points if you drink this island-influenced shake out of a coconut shell. Take advantage of the flavors of summer with a fresh, juicy peach protein shake. Put a new spin on your protein shake with fresh fruit. Everything great about a daiquiri, without the hangover. Experiment with every kind of fruit in the store until you find your favorite signature recipe. The fiber from the peach makes this smoothie extra filling. This simple shake has protein, carbs, and electrolytes, making it perfect for refueling after the gym. Whip these up for your fit friends and you won't miss the alcohol. Spirulina may look weird, but don't knock this superfood till you try it. Flaxseed oil gives you extra energy, fills you up, and is rich in omega-3 fatty acids. Try this breakfast smoothie of champions for a quick fix packed with health-boosting ingredients. If you're trying to gain weight, eating enough whole food to meet your caloric needs can be dang near impossible. That's when protein shakes can be really helpful. These muscle-building recipes are full of calories and protein so you can grow! To make these shakes even more calorie-dense, try a mass-gainer protein powder. You'll get more carbohydrates and fat (and therefore more calories) than you would using a whey isolate. Lift big and eat bigger! Pro tip: Use a high-powered blender when you use crunchy ingredients like apples. Maximize your gains and make your gym bros green with envy with this incredible protein shake. This almond shake is a quick way to down a whole lot of healthy calories, fast. Egg whites make this shake extra rich and frothy. Try adding a little nutmeg to this decadently custard-like shake, and enjoy bulking season.